Grand duke of Lithuania and king of Poland; born 1427; died at Grodno 1492. He succeeded to the grand duchy in 1440, and followed his brother Ladislaus III. on the throne of Poland in 1447. For the greater part of his reign, when the influence of the clergy was lessened by the greater aggressiveness of the executive power, the Jews of Poland and Lithuania enjoyed happy days, as in the times of Casimir the Great. Casimir continued the liberal policy of his predecessor Withold toward the Jews of Lithuania; but he did not confirm the privileges Withold had granted to them. Bershadski thinks that this was not because of antipathy to the Jews, but because he had probably left it to the elders to rule them, or that he followed the example of his father, in allowing the Jews of Lithuania to enjoy the more extensive privileges of the Jews of Poland. 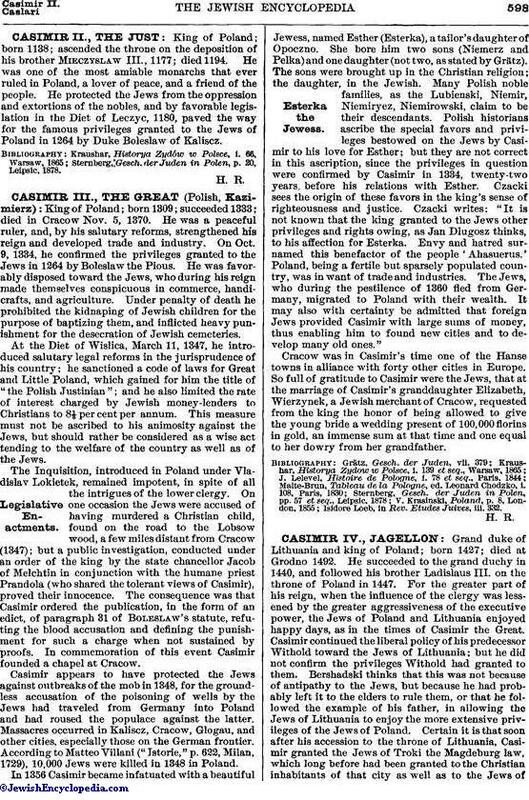 Certain it is that soon after his accession to the throne of Lithuania, Casimir granted the Jews of Troki the Magdeburg law, which long before had been granted to the Christian inhabitants of that city as well as to the Jews ofWilna and Kovno. According to this law, the Jews of Troki were subject to the jurisdiction of a Jewish bailiff, elected by his coreligionists and confirmed for life by the king, to whom alone he was responsible. Soon after Casimir's accession to the throne of Poland, while he was visiting Posen, a fire broke out there, in which the original document, enumerating the privileges granted to the Jews by Casimir the Great (1334), was burned. Casimir IV. not only renewed and confirmed the old privileges, but granted new ones, such as the Jews of Poland had never before enjoyed. Owing to the intrigues of Cardinal Olesnicky Zbiegnew, archbishop of Cracow, and of the monk John Capistrano, these privileges were abolished in 1454 on the pretense that they "conflicted with the laws of God and of the country." This repeal aggravated the condition of the Jews of Poland and led to the riots of Cracow (April 12, 1464), in which about thirty Jews were killed. 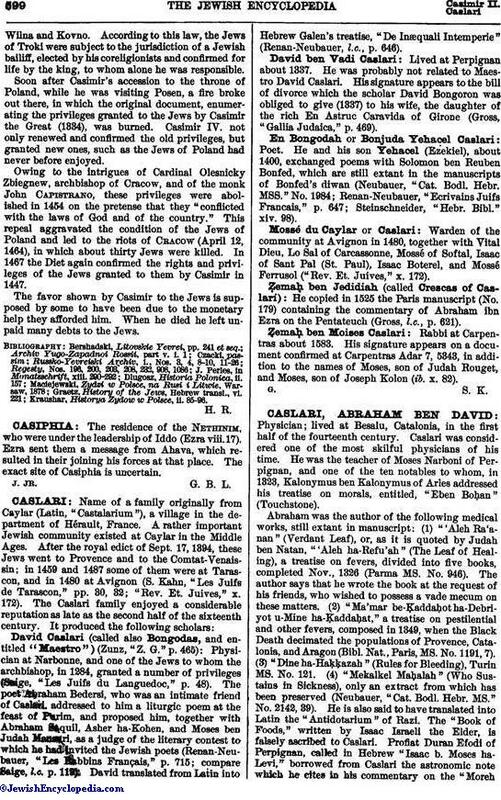 In 1467 the Diet again confirmed the rights and privileges of the Jews granted to them by Casimir in 1447. The favor shown by Casimir to the Jews is supposed by some to have been due to the monetary help they afforded him. When he died he left unpaid many debts to the Jews. Kraushar, Historya Zydow w Polsce, ii. 85-96.